Sorry for the break folks! But we are back at it here at Bash. Here are a few pics I'm loving from around the web. It's cold outside! Loving this oversized, neutral, cozy sweater. This pretty, pink and pastel closet. Not sure which I love more - the clothes or the closet. I get excited eery time I see our copper Ashton chairs in the wild. Are those mint velvet mid century modern dining chairs? Why yes. Yes, they are. O U R E N T I R E W E B S I T E I S L I V E ! ! ! Check out our new Homepage and all the Goods. I've seen these images floating around recently and love it. I will never be this cool. I kind of love this picture. That's all. H A P P Y V A L E N T I N E S D A Y ! ! I know we are just getting into fall now but how amazing is this calendar by Danish graphic designer Kristina Krogh? Reeeallllyy amazing. I'm off this weekend on a much needed girls trip. Food, shopping (for business and pleasure...well, let's be honest now... ; ) and fun. See ya next week! Go outside and have some fun. 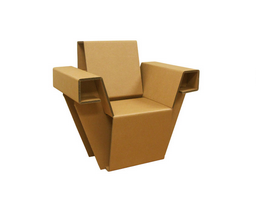 Would you want or buy cardboard furniture? I saw this stool on Apartment 34. I was drawn to its modern shape, steely color but soft look. I was further shocked to find out that it's made of cardboard. This prompted a search for other cool furniture of the same make. There's tons! Who knew? No worries about sturdiness there. For this summers go to sandal. A or B? Check out this image and idea from The Chalkboard Mag for a Mother's Day gift. Simple, colorful items mom would use, packed stylishly in a wooden box or basket. Happy Mother's Day! Sign up to receive periodic updates from Bash. We promise to keep them short and sweet!